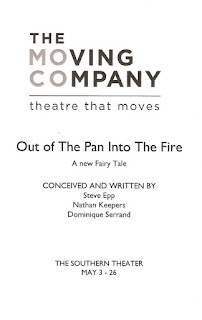 If you're a theater fan living in the Twin Cities, you need to experience The Moving Company at least once (and like potato chips, you probably won't be able to stop at just one show). What they do is so totally unique and innovative, and completely their own style - original work with creative storytelling, sometimes perplexing, sometimes profound, always interesting. Their new production is a modern original fairy tale, inspired by the classics collected by the brothers Grimm, but bearing no direct resemblance to any of them. Out of the Pan Into the Fire is at times amusing, moving, poignant, odd, sad, and sweet. Serving as a storyteller and narrator, as well as a character within the drama, the endlessly watchable Steve Epp plays Angelo. He begins the show reading a story from a book, a story from "a time when wishing was of some use," and then takes part in that story. Angelo collects children to raise and then send off into the world, and is left with just two oddballs who've never quite left. Elsie (Christina Baldwin like I've never seen her before, but just as captivating as always) is the super smart young woman who knows everything but has experienced nothing. She's deathly afraid of leaving her safe home and going out into the world. She's a sort of awkward child-woman, dressed in rags and dorky glasses with clothespins in her hair. Her brother Thirteen is her exact opposite - dumb as a rock and afraid of nothing, because "he doesn't know enough to be afraid." In Nathan Keepers' usual physical style of character creation, Thirteen is like a big eager happy puppy dog, who only wants to be loved and be happy and play with his best friend, potato. Christina and Nathan created a beautifully doomed romantic couple in last year's Werther and Lotte, and now with Elsie and Thirteen they have created a funny, sweet, and genuine sibling relationship. This odd little family is happy, but Angelo knows that he has to send his children out into the harsh world to complete their development as human beings. Angelo leaves so that Elsie will have to face the world and experience the heartbreak that goes along with it (for true wisdom is knowledge plus experience), and Thirteen will learn fear (which is, as Elsie tells him, dread plus reverence). Growing up is hard, as these two overgrown children learn. The world in which this story takes place is quite magical. Upon entering the Southern Theater, I was immediately captivated by the little chairs in graduated sizes, from child-sized to doll-sized. The set (designed by director Dominique Serrand) is comprised of odd spaces created by cardboard, a locker, a raised stage area, plastic garbage bags, and various other compartments. There are secret doors and windows, from which characters suddenly appear and disappear (leading to several moments of "how'd they do that?!"). Delightful and surprising things happen with the set and props; there is wind, ice, rain, and dirt (without spoiling everything, there is significant clean-up that must happen between shows). 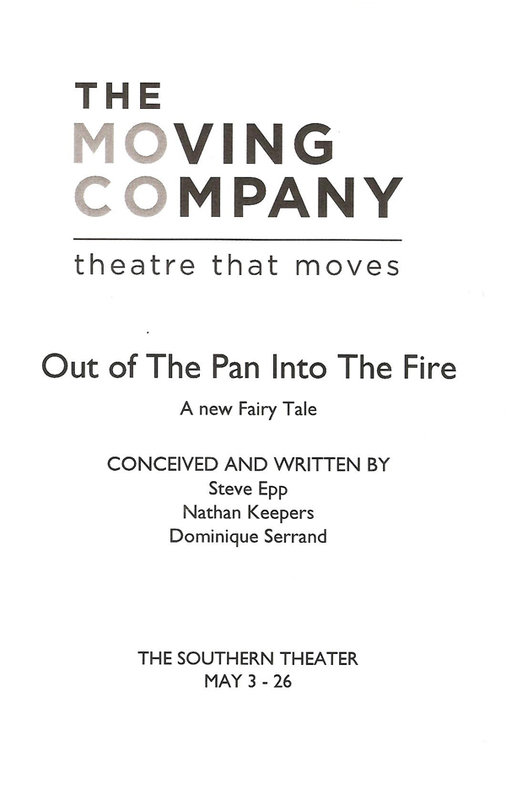 The cool thing about The Moving Company is that often the actors help in creation of the work (this one was written by Steve, Nathan, and Dominique), so that the characters are suited to the particular talents of the actors, whether it's Nathan's crazy physicality, or Christina's lovely voice (which she does use here), or Steve's great storytelling. Watching the three of them (along with Sam Kruger, who plays a couple of small but impactful roles) play in this strange and magical world is a joy. One that you really must experience to fully comprehend. Check them out at the Southern Theater through May 26, and in the meantime, you can contribute to their Kickstarter campaign to help fund the project.